While most of the world is familiar with raspberries and blackberries, in Texas we have a wonderful relative of those berries – the dewberry. These uniquely flavored berries are natural and grow wild along the roadside—or if you’re lucky—in a pasture (as long as they have a suitable environment to grow). The small green berries appear after flower pollination, then slowly transform to red and –finally—the ripened black color. Unfortunately, Dewberry season is over by early to mid May. 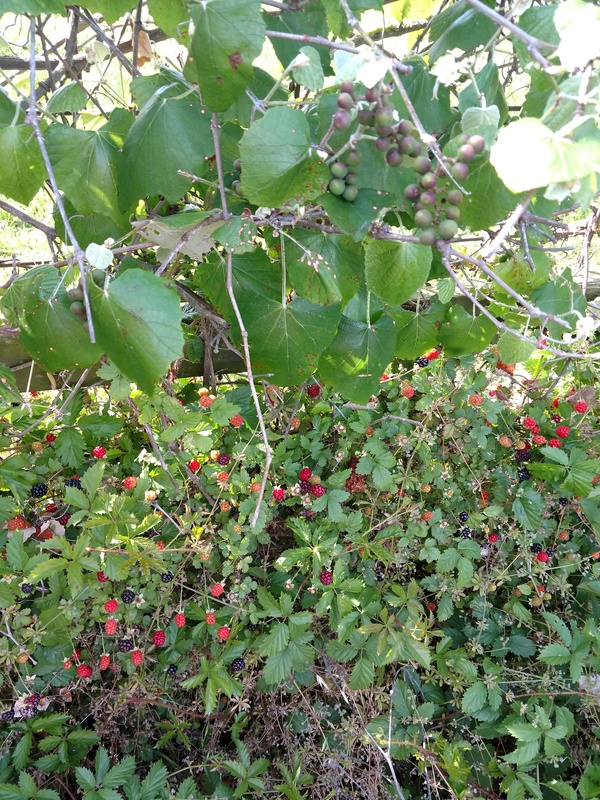 The berries are growing along a fence that separates yard from pasture. 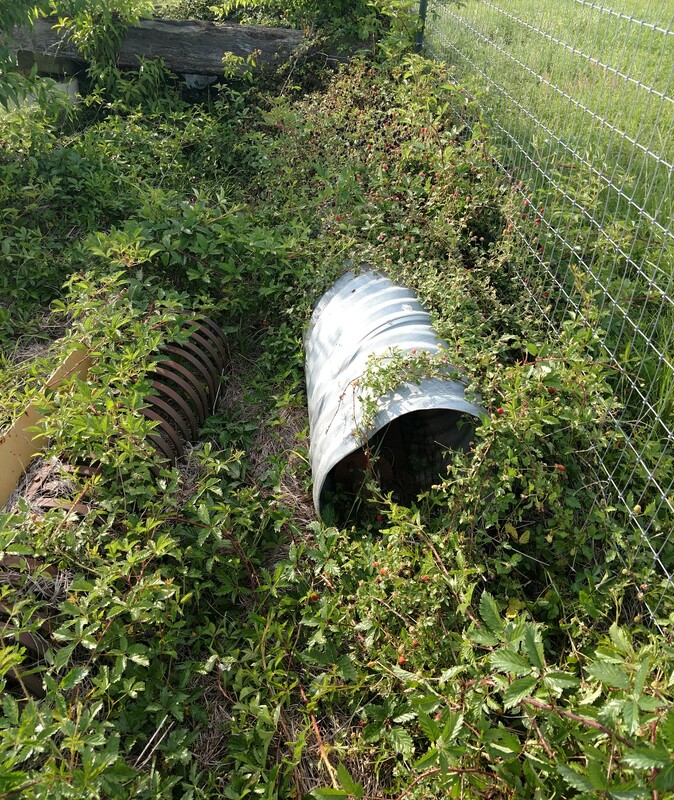 In this picture, the vines are supported by a tractor rake implement, plus growing over a few logs and a drainage pipe (not being used, just stored). These vines are allowed to naturalize—to grow at will and die back as nature intends. Eventually, the vines will die back with heat, and more with the winter winter cold but quickly appear and grow from late winter until they are ripe (late April through mid May). Although anyone who has picked dewberries can readily verify, the vines include a number of vicious spines that are capable of inflicting a lot of pain, so it’s best to have a small stick to gently raise a section and pick without a painful jab! 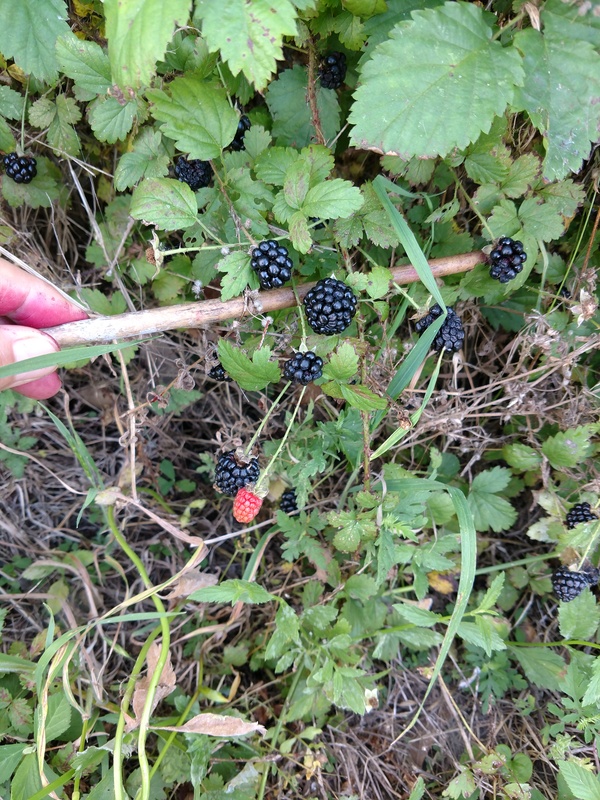 It is difficult to use gloves to pick these berries without smashing them, so be prepared for berry-colored fingers. This year, we gathered 2 gallons. Worth every stain, scratch and jab! Dewberries are easy to freeze and will maintain their unique flavor very well for about 6 months (or more if vacuum-packed). To freeze, rinse off dirt and debris, place on a cookie sheet, freeze for about 1.5 hours, then add to a freezer bag. Because these are frozen before adding them to a bag, they will not stick together, and can be pulled out in any desired amount for a cool treat once the summer heat arrives (or anytime, really). They are also great to use for pies and cobblers (fresh or frozen berries). This year, I noticed the Dewberries growing with the Mustang grapes and can be seen here with immature berries and grapes. The Mustang grapes are sometimes confused (in name only) with Muscadine grapes, but they are very different in appearance (Mustang grapes are smaller will more grapes per cluster). 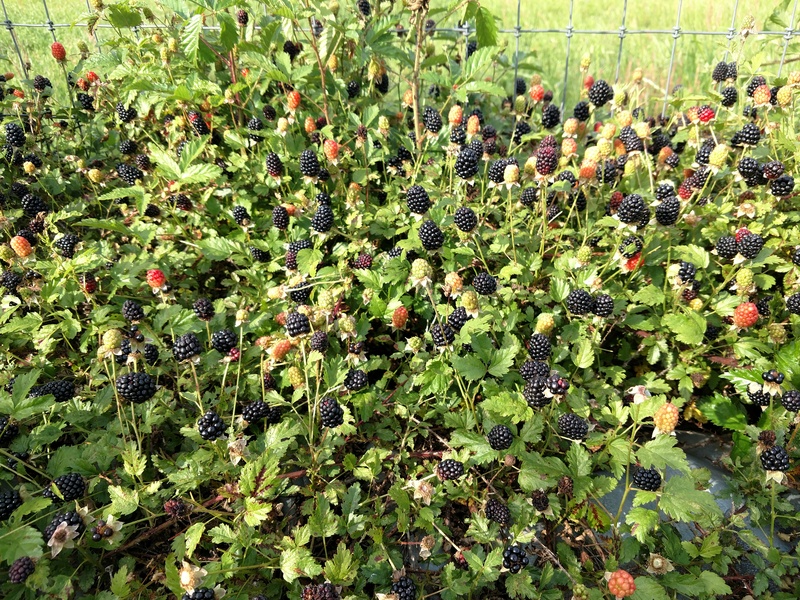 This year, we added 3 varieties of blackberries to the gardens. I’ll save that blog story for another day!